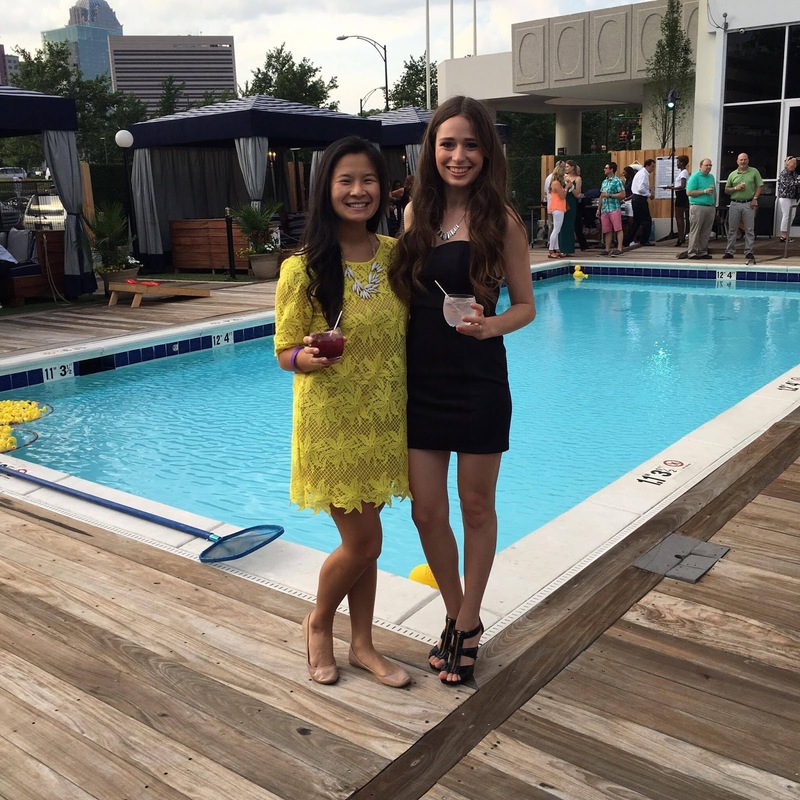 City Lights and Craft City Social Club Launch Party Recap! 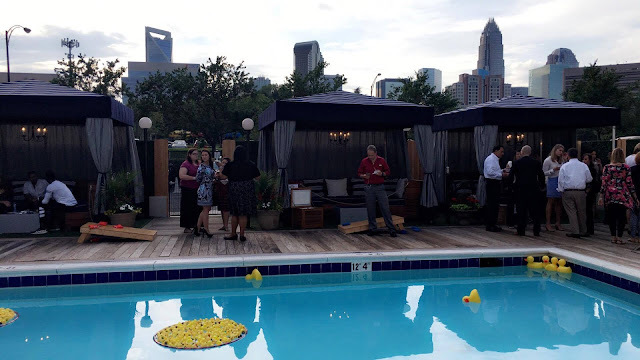 I was invited to attend the grand opening party for two new Uptown Charlotte social venues last night, and I had the most wonderful evening! City Lights Rooftop Bar at Le Meredien hotel is the new kid on the block in Charlotte's rooftop bar scene, and its sister venue Craft City Social Club (which is located next-door at the neighboring Sheraton Hotel) is bringing a pool and day club atmosphere to Uptown. Their joint opening events were quite the party! My new friend and fellow Charlotte fashion blogger Amy, from Pastel n Pink, was my guest for the evening's activities! The first part of the evening was spent exploring the Craft City Social Club at the Sheraton Hotel. This is a pool and day club, with private cabanas (pictured above!) available for rental. There is a full service bar, and a fun latin inspired menu. Craft City Social Club also does a special twist on their menu for brunch on the weekends! I think that this would be such a fun place to bring a group of friends to on a weekend in the summer. A beautiful pool, cozy cabanas, a delicious menu and bar and great views of Uptown Charlotte?! Count me in! 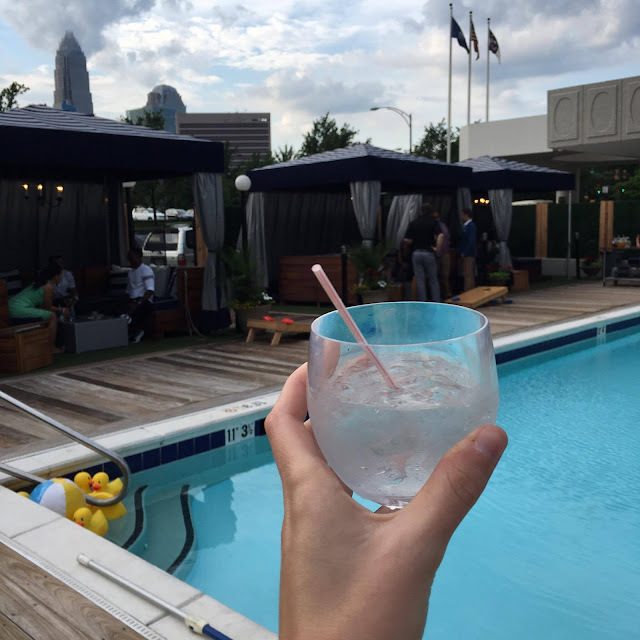 The second portion of the evening took place in the neighboring Le Meredien hotel, which is home to Charlotte's newest rooftop bar, City Lights. I feel like the few iPhone photos that I was able to take during the event do this venue no justice at all! 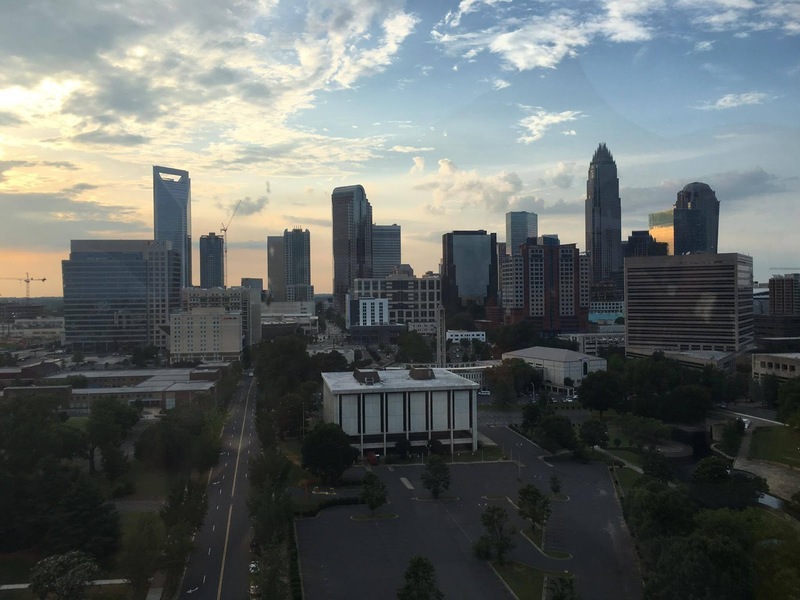 I have never seen views of Charlotte like this- I was completely blown away! 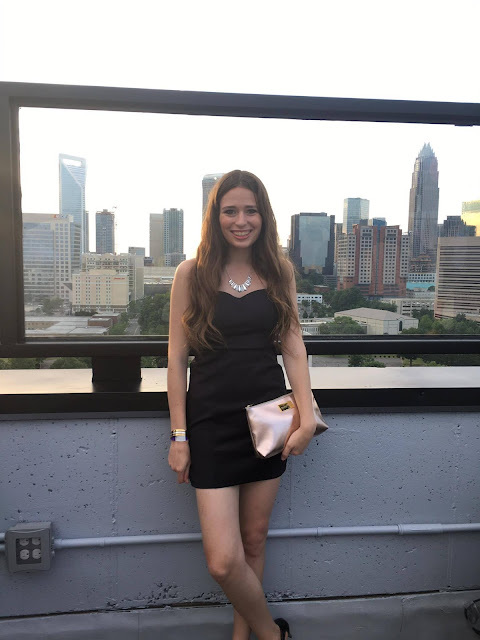 Charlotte has my favorite skyline of all, and the incredible panoramic views from the balcony of City Lights are unbeatable. 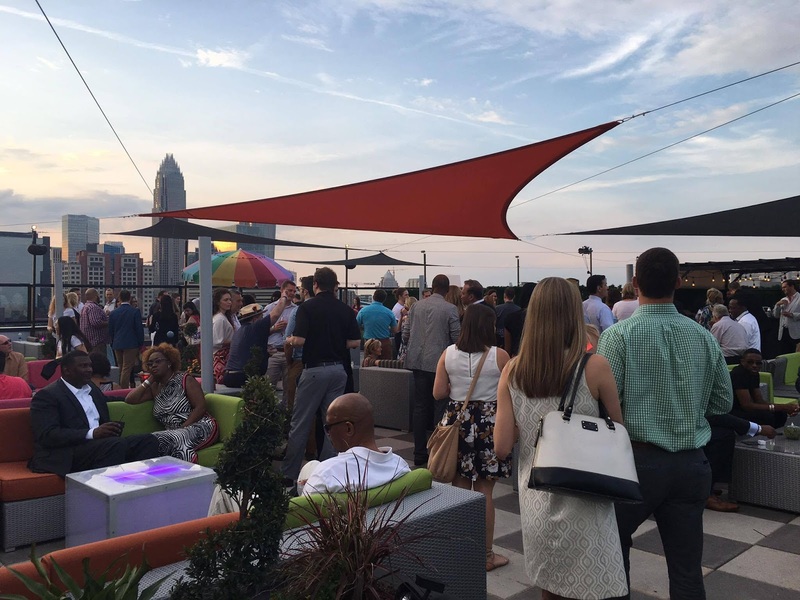 Charlotte does have another well-known rooftop bar and restaurant called Fahrenheit, which I have been to once briefly before. But I think that City Light's views absolutely blew Fahrenheit out of the water, and that is saying a lot! A huge thank-you to Craft City Social Club and City Lights Rooftop Bar for hosting Amy and I at their grand opening launch party! We thoroughly enjoyed both events, and hope to return to both places soon! The great city of Charlotte has so much to offer, and I hope to feature more of my favorite Charlotte spots on the blog in months to come! I'm so glad I was able to follow along with you last night on snap-chat, it looked like you were having an awesome time! I may just have to try to recreate one of those sparkle & pop's for myself, they sound delicious! Enjoyed your grand opening venue post and awesome view of Charlotte!! You look lovely in your dress! Looks like you had a lot of fun! 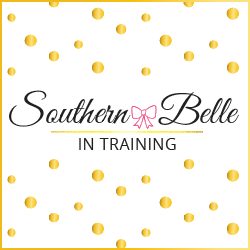 Your dress is GORGEOUS! The rooftop bars look awesome! That's one thing Grand Rapids is lacking!